Growing up in the mountains, a few years ago, Iqrar moved to the coast – a journey that would change his life, and help him save the lives of countless marine species. What would you do if you found yourself face-to-face with the biggest shark on our planet, 18 feet long and overwhelming in every sense of the word? It is an experience only few people on Earth have shared and Iqrar is one of them. Hailing from the north of Pakistan, Iqrar grew up in the mountains, miles away from the coast. He worked as a labourer and a few years ago, he made the long journey southwards in search of new opportunities – a journey that would change his life, and help him save the lives of countless marine species. 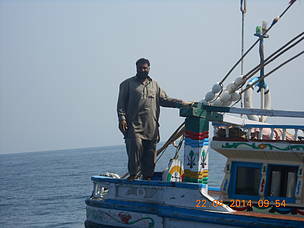 The waters in and around Pakistan are extremely rich in marine megafauna. Whales, turtles, rays, dolphins…the list of incredible species that call the Arabian sea home is impressive. Unfortunately, the waters are also home to around 500 gillnet vessels targeting tuna and tuna-like species. Every year, hundreds, if not thousands, of sharks are caught in these nets and if it wasn’t for committed fishermen and crew like Iqrar, the tide would never turn. 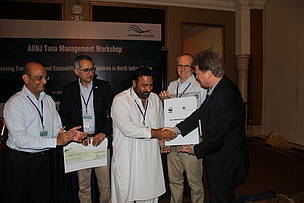 Iqrar is part of WWF-Pakistan’s crew- based observer programme that is aimed at working with local fishermen, staunch stewards of the sea, to change practices, attitudes and extend cooperation toward sustainable fishing and management of marine resources. Since 2012, Iqrar has helped provide data on all the fish that he catches, including fishing locations, and species composition. In addition, he has also inspired his crew and others to take the initiative to release endangered, threatened and protected (ETP) species caught alive or entangled in their nets. In the past five years, Iqrar and his crew of 15 have rescued 18 whale sharks, 2 manta rays, 1 guitarfish, 2 sunfish, 3 sea snakes, 3 rhomboid squid, 1 beaked whale, 2 bottlenose dolphins and hundreds of sea turtles. It is a challenging job requiring commitment, courage and quick action. 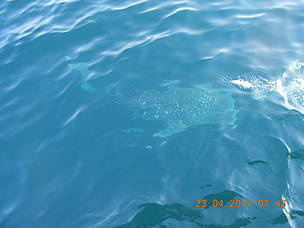 And sometimes, when it comes to whale sharks, it takes much more! Iqrar remembers how once, while fishing near the Khori Great bank, he saw ‘something huge, giant, entangled in the net’. It took him and a fellow crew member more than 30 minutes to free the whale shark, called a ‘darwaish’ or ‘a saint of the sea’ locally. For his crew members, the story of the whale shark is a powerful example of Iqrar’s commitment toward saving critical marine life as well as protecting resources for future generations. “Previously we just went in the sea and thought everything is ours - we can do what we want, but we are slowly understanding, learning and becoming part of something big. We may be illiterate but weunderstand that ensuring livelihoods for future is much more important than to satisfy our own greed”, said a young crew member working for Iqrar. Iqrar receiving the ‘best fisherman of the year’ award from WWF-Pakistan. WWF-Pakistan trains local fishermen to identify and rescue endangered, threatened and protected (ETP) species caught alive or entangled in their nets. Iqrar on board his ship.